Is Daybreak's PlanetSide Arena a new Battle Royale game? Is Daybreak’s PlanetSide Arena a new Battle Royale game? A new PlanetSide game may be in the works at Daybreak Game Company's offices, according to a trademark that was discovered and spread around by MassivelyOp. 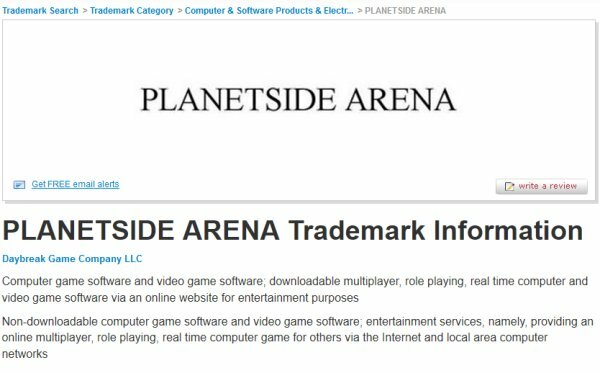 PlanetSide Arena is the name of the trademark and when I heard it, alarms started going off as the words “Battle” and “Royale” invaded my mind. It's highly likely to happen, as PlanetSide 2 is still around and – yikes! – a lot of assets could be reused for some fast development. Or maybe it could be another type of game entirely – a Hero Shooter isn't completely out of the equation. On the other hand, Daybreak is also working on Mythwarden, PlanetSide 3 and EverQuest 3. Sure, of course they are. Take all of this with a grain… no, with tons of salt.